There was never any question of including this book on my tour list. Before I had even received the book I knew that I loved it. Line of Fire: Diary of an Unknown Soldier is exactly what the title implies; the diary of an unknown soldier. One winter’s morning, Barroux was walking down the streets of Paris when he passed a house which was being emptied of rubbish; piles of old belongings, wrappers and refuse had been placed in the street. ‘We are emptying the basement. Help yourself if you like’ he was told by one of the people ferrying rubbish onto the street. It was at this point that Barroux picked up an ageing yellow diary from amongst the rubbish. A diary which belonged to an unknown soldier serving during world war one. 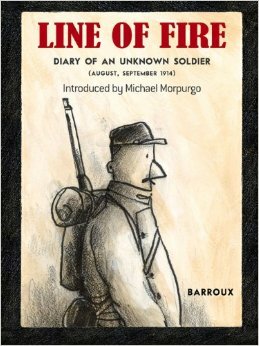 Barroux took the diary and from it created Line of Fire, a graphic novel depicting the words written by an unknown French soldier…may his words never be forgotten. This book was such a find! I’m over the moon to have discovered it, read it, and to have a copy of my own. The illustration style fits so perfectly with the subject; you can almost imagine the soldier himself drawing them. They are simple, almost childish, yet graphic, as though they have been scratched with a piece of charcoal salvaged from the embers of long extinguished fire. They remind me, in some ways, of images I have seen drawn by soldiers on the front line. Although the sketches undoubtedly carry Barroux’s distinctive style, there is much in the way of reality present in the scenes. 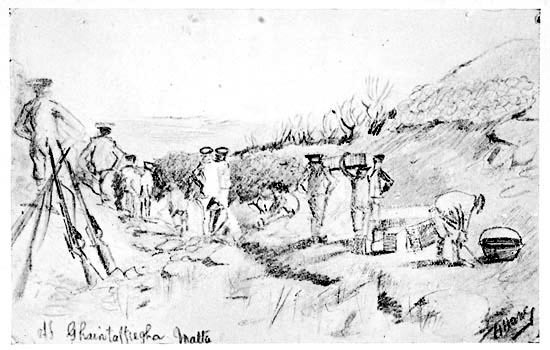 I am reminded of the images in A Soldiers Sketches Under Fire by Harold Harvey – real images sketched by a soldier on the front line. It feels strange to review the words of a man when I know nothing about him. Although Barroux is listed as the author of the book, the words belong to the Unknown Soldier. They are exactly as they were found, although in the case of my copy they have been translated into English from their native French. They are powerful words, and although it does not take long to read the book, the effect of the story is far reaching and potent. The Unknown Soldier speaks of the things which are sure to have plagued any man on the front line of WWI. His fatigue, it is crippling, and he feels dead on his feet – ‘My feet are bleeding, My legs can no longer hold me up. This isn’t a man who’s walking but a sheep following the flock.’ He is never able to rest for more than a few hours before being aroused, often in the dead of night, to move on to the next place. He takes to sleeping on piles of straw, where they are available, next to his companion Fernand, sleeping close together for warmth, and, I expect, comfort. Our Soldier worries about those he has left behind. He is so worried, plagued by worry each time he receives no word from home. It is moving to see the worry from the other side. It is well known that those that are left behind will worry about their father, brother, son, or husband who has gone away to fight, but the soldiers words show that the worry tortures him equally. ‘The women weep. It’s up to us to show that we’re stronger than they are and convince them that we will return.’ When he does hear news his release is evident, as though he has let out a deep breath of relief; ‘at last I receive some postcards from my dear wife’. The horror of war is also painted on the pages of the diary, not so much in Barroux’s drawings, but in the soldier’s words. The words are not complicated or flowing, but to the point, and powerful – you can smell the gunpowder, hear the crackle of artillery fire, and see the horrors that the Unknown Soldier scrawls within the pages of his diary. ‘This is where a powerful shell landed on a platoon of the 6th company, which was partially destroyed’ he writes, having seen the remains of a soldiers leg hanging from a tree branch. Once out of the line of fire, he is faced with a lengthy journey to a hospital, all the while in indescribable pain, and with a raging fever which forbids him rest and sustenance. It is once he arrives at hospital, and his fever begins to subside that he is faced with another, unimagined issue – boredom. For a week we hear nothing of the Unknown Soldier, and then, he writes of his boredom, the slowness of the days, his heavy heart, and his feeling that life is carrying on all the same outside of the hospital walls. ‘Sometimes I’m sorry I didn’t stay in the line of fire’ – and with these words the Unknown Soldier’s story ends. Line of Fire has left me feeling such a strange mix of emotions, with so many questions running through my mind. The power of the Unknown Soldier’s last words are incredible, and only made more so by the fact that he, undoubtedly, never expected anyone to read his diary. Who was this man? And why did he stop writing? Questions I will find myself often asking, and will never know the answer to. I would recommend this book to almost anyone. Even if you don’t feel drawn to Barroux’s illustrations the power of the Unknown Soldier’s words will not fail to captivate. History students, WWI fanatics, children and adults alike, this is a lesson in history, and an important one at that. Read it and pass on the recommendation. I like to read “real life” stories of world events like this as more authentic than fiction. Also speaks of the views/emotions of ordinary persons caught in events they are caught in…..like the review writeup. Thank you! I really enjoyed this one, it was so moving. Have you read it? You can pick up second hand copies on Amazon for quite cheap, I would strongly recommend it.